The Donegal native had been linked with a move to Bellator after his contract with the UFC expired. 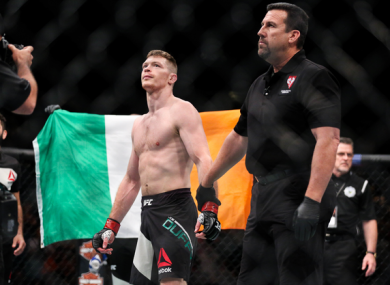 JOSEPH DUFFY HAS decided that the Ultimate Fighting Championship is the best place for him to resume his mixed martial arts career. Duffy’s manager, Corkman Graham Boylan, confirmed to MMAFighting.com today that the Donegal lightweight has inked a new seven-fight deal with the UFC. The 29-year-old signed a five-fight contract with the organisation in January 2015, before embarking on a 4-1 run. Comprehensive victories over Jake Lindsey, Ivan Jorge, Mitch Clarke and Reza Madadi were split by a decision defeat to Dustin Poirier. Duffy’s deal with the UFC expired following his unanimous-decision victory over Madadi in March. He expressed his desire to weigh up his options as a free agent, with rival organisation Bellator admitting their interest. The Montreal-based fighter told The42 ahead of his clash with Madadi that he had grown frustrated with the UFC’s policy of seemingly valuing marketability over skill when it comes to its athletes, which was reflected in the terms of his new contract. But Duffy — who holds a 17-2 professional record — has now come to an agreement with the UFC to commit his long-term future to the organisation. “[Joseph] is happy with the new deal and is looking forward to getting back in and being more active,” said Boylan. Email “Duffy ends speculation over his future by penning new long-term UFC deal”. Feedback on “Duffy ends speculation over his future by penning new long-term UFC deal”.